In celebration of Mother’s everywhere, join us in the Baur’s Listening Lounge salon for a rousing and intimate Mother’s Day performance featuring mother and daughter piano duo, Katie and Bobette Mahan. 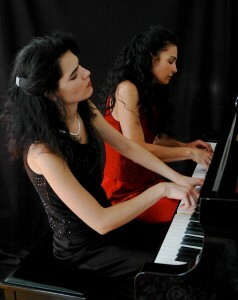 A special performance developed specifically for Listening Lounge fans, the event will feature a special mother and daughter solo and duet piano performances that will include their unique take on Gershwin’s “Rhapsody In Blue”. American pianist Katie Mahan is capturing the attention of audiences throughout the world for her innovative musical personality, poetic interpretations, and graceful, charming state presence. Katie’s playing epitomizes the the French style of elegance, beauty and poetry. Since making her orchestral debut in 1999 performing Gershwin’s Concerto in F with the Breckenridge Symphony; Katie has appeared in concert throughout the USA, Europe, Canada, the Middle East, Russia and Japan. Conductor Marin Alsop described her playing as “in the style of Clara Schuman”. She has recorded six cds featuring a diverse repertoire. An unusual performance for Mahan, she will also perform a number of duets with her mother, Bobette. Presented in the intimate setting of Baur’s salon, Katie will perform solo on the Music Appreciation Society’s People’s Piano, a 2002 Steinway known for its roaring sound and pitch perfect tone. A number of limited tickets and membership packages are on sale now for this exciting Mother’s Day celebration at www.masmusic.org. Doors open 1 hour before show time for Members and Premium Ticket Holders and 30 minutes prior for General Admission.